Prototype: Bavarian class G 55 steam freight locomotive, with a type 2 2 T21 8 coal tender. Road number 5865. 2 type Hrz Regensburg gondolas with board walls and stakes. 1 type X Wurzburg low side car with board walls, as a crane tender car. 1 crane car with 5,000 kilograms 5.5 tons capacity. 1 type P Munchen baggage car. The locomotive and the cars are painted and lettered for the Bavarian Group Administration, German State Railroad. They look as they did around 1923. World of Operation mfx+ digital decoder and a variety of operation and sound functions included on the locomotive. Model: The locomotive has an mfx+ digital decoder and extensive sound functions. It also controlled high-efficiency propulsion with a flywheel, mounted in the boiler. 5 axles powered. Traction tires. The locomotive and tender are mostly constructed of metal. A 72270 smoke unit can be installed in the locomotive. The dual headlights change over with the direction of travel. They and the smoke unit that can be installed in the locomotive will work in conventional operation and can be controlled digitally. A third headlight for oncoming trains is on the front of the locomotive and the rear of the tender and can be controlled separately in digital operation. Maintenance-free, warm white LEDs are used for the lighting. There is a close coupling with a guide mechanism between the locomotive and tender. There is a close coupler with an NEM pocket and a guide mechanism on the front of the locomotive and the rear of the tender. The minimum radius for operation is 360 mm / 14-3/16". Piston rod protection sleeves and brake hoses are included. 2 gondolas are loaded with lumber. The baggage car has lighted marker lanterns. Total length over the buffers approximately 73 cm / 28-3/4". The Bavarian State Railroad purchased 15 class G 5/5 locomotives for the steep Bavarian grades as early as 1911. Following Bavarian tradition, these five-axle units were designed as four-cylinder super-heated compound units. 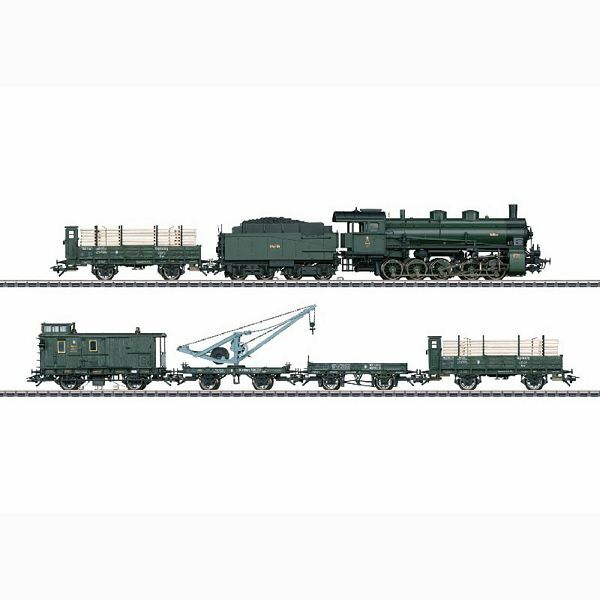 They generated around 1,650 pounds per square inch and were thus superior to all other provincial railroad designs. A bar frame was another modern feature. One each high-pressure cylinder and an outboard low-pressure cylinder were attached to a cast piece. Outboard-mounted Heusinger valve gear with stirrup pieces provided steam distribution to the high- and low-pressure cylinders by means of common piston slide valves. All four cylinders were connected directly to the third wheel set. In 1920, additional locomotives followed the units from the first series. These additional units had larger cylinder diameters, a larger super heater, as well as a pre-heater with an associated feed pump. This gave them a somewhat higher performance than the prewar locomotives. In addition, the previously "airy" cab was replaced by the design with better protection for the locomotive crews that had become customary in the meantime. Eighty locomotive of the successor series were delivered and placed into service by 1924. The G 5/5 was the most powerful five-axle steam locomotive of all the German provincial railroads and could pull up to 1,210 metric tons up a grade of 0.5 % at a speed of 40 km/h / 25 mph. They easily left the Prussian G 10 and G 12 as well as the later DRG classes 50 and 52 in the dust. The DRG only took over seven units from the first series with road numbers 57 501-507. The successor series by contrast was fully taken over by the German State Railroad, and the units were given the road numbers 57 511-590. After World War II, only 17 units were still in existence mostly in storage in the area of the later DB.